Medina defeated host Wilson 3 1/2-2 and Roy-Hart downed host Barker 5 1/2-0 this afternoon as the Mustangs and Rams both improve to 3-1 in Niagara-Orleans League tennis competition. Haylee Seefeldt’s win at second singles proved to be the decisive point for Medina which also swept the three doubles matches with the duos of Kody Leno-Jonathan Pietrafesa, Ben Zakes-Carter Green and Isaac Pace-Emma Baldwin. Joey Moote won at first singles and Jacob Hecko at third singles for Wilson which slips to 1-3. Cameron VanBuren, Collin Dodge and Dominic Pericciny scored wins in singles competition for Roy-Hart. The Rams also swept the doubles matches with the teams of Michael and Jason Kuchey, Aspen Moore-Kayla Hagen and Jordyn Bobzein-Zoey Haynes. The loss drops Barker to 0-5. In the other match, Newfane (1-2) downed Albion (2-3) 4-1 1/2. Carson Bader won at first singles for Albion as did the Purple Eagles third doubles team of Collin VanGorder-Andrew Caldwell. Photos by Cheryl Wertman – Medina’s Matt Saj gets tagged out on the foot while diving into secod base by Akron’s Jack Klodzinski during the Mustangs win over the Tigers this afternoon at Vets Park. Getting back onto the winning track, Medina bested Akron 6-2 in a Niagara-Orleans League game at Vets Park this afternoon. Rebounding from their first loss of the season (5-3 to Roy-Hart in 8 innings Tuesday), the Mustangs jumped out to an early 5-0 lead. 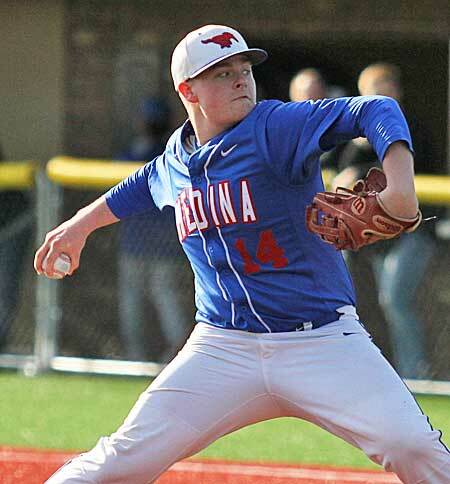 Chris Goyette went the distance on the mound for the Mustangs. An RBI single by winning pitcher Chris Goyette and a double steal play gave Medina a quick 2-0 lead in the first inning. A single by Nate Sherman and a walk set up the opportunity. The Mustangs quickly tacked on three more runs in the second inning on a two-run single by AJ Seefeldt and an error. A walk and a single by Brian Fry ignited that uprising. Seefeldt had a big day at the plate as he also banged out a solo home run in the sixth inning and had a double in the fourth frame. Goyette went the distance on the mound allowing 4 hits and striking out 8. Akron’s only scoring came on a two-run double by Mitchell Holtz in the sixth inning. Medina improves to 4-1 in the league and 9-1 overall while Akron slips to 2-2 in N-O competition. 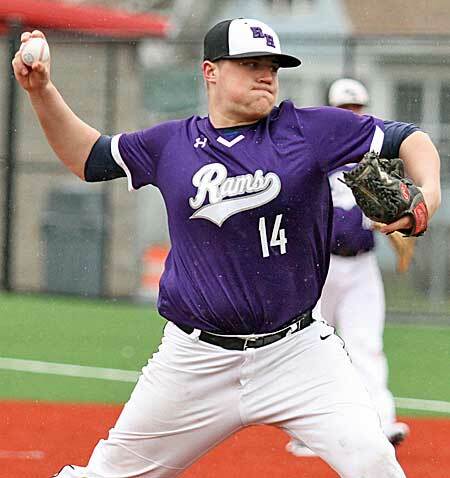 Trailing 5-3, Wilson scored three times in the sixth inning to hand defending champion Roy-Hart its first N-O loss. A single by winning pitcher Ian Evans, an error and a double by Patrick Seeley accounted for the Lakemen’s decisive three runs in the sixth. A double by Tom Baia ignited the uprising which also included a single by Steve Frerichs. On the mound, Evans scattered 10 hits and struck out 13. Charlie Bruning, Gavyn Boyle, Noah Hardy and Tom Russo each had a pair of hits and an RBI for Roy-Hart. Wilson is now 2-0 and Roy-Hart 2-1 in N-O competition. Garrett Srock went the distance on the mound with 14 strikeouts for Newfane in a 5-1 win over Barker. Cade Littman had a two-run double and Matt DiTullio 2 hits for the Panthers. Newfane is now 1-2 and Barker 0-4 in N-O action. 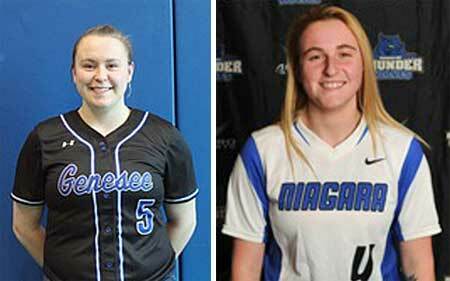 Snapping a brief season opening two game losing streak, Barker bested visiting Newfane 12-7 in a Niagara-Orleans League softball game this afternoon. A grand slam home run by Jessalynn Coen with two out in the second inning highlighted the win for the Lady Raiders. Coen, Holly Wasnock, Emily Wagner and Kaitlynn Kimber each banged out two hits for Barker. Kimber’s hits included a triple. Barker is now 1-2 and Newfane 0-2. 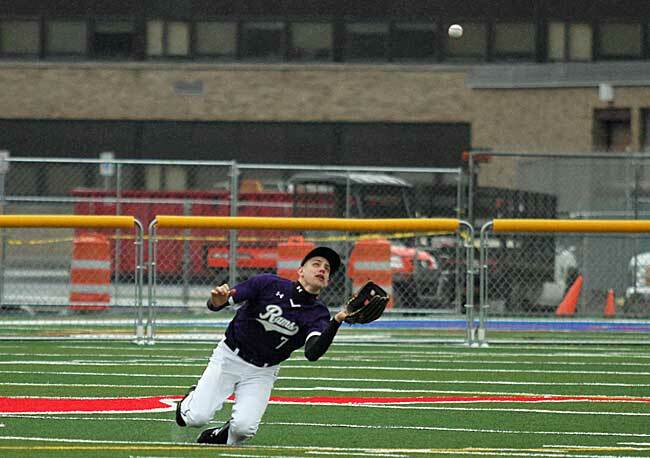 Six home runs highlighted the offense as defending champion Roy-Hart downed Wilson 26-1. Mallory Steiner had three home runs and Maddie Fry a grand slam for the Lady Rams which also got homers from Jamie Bower and Claire Halstead. Reanna Perkins picked up the win in the circle. Roy-Hart is now 2-0 and Wilson 1-1. Camri King had a two-run home run for Medina in the 9-2 loss at Akron. Medina is now 2-1 and Akron 1-1 in N-O action. Roy-Hart downed visiting Wilson 84-57 in a Niagara-Orleans League girls track meet this afternoon. Anna Rickard was a triple winner in the 800, 1500 and 3000 and Nadia White doubled in the 400 and triple jump to lead the way for Roy-Hart which also got wins from Ellie Scharping (High Jump), Sam Choate (200) and McCarthy Lang (Pole Vault). Roy-Hart is now 1-2 and Wilson 0-2. Wilson did gain a split on the day by downing Roy-Hart in the boys meet 85-56 as John Littere doubled in the High Jump and Discus, Marcell Wilson in the 100 and Long Jump and Will Schwarzmueller in the 1600 and 3200. Will Rickard won the 400, Ethan Lindke the 110 Hurdles and Nate Bower the Shotput for Roy-Hart. Wilson is now 1-1 and Roy-Hart 1-2. 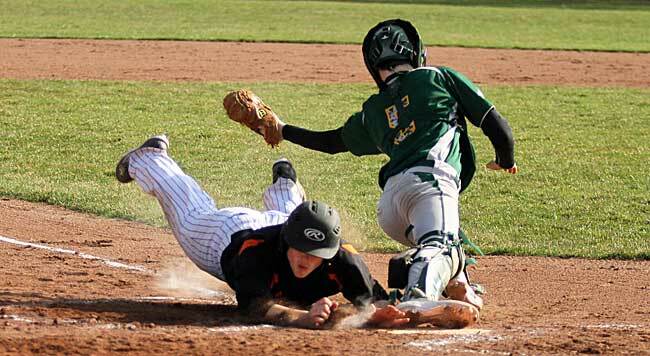 Photos by Cheryl Wertman – Noah Heinsler slides safely into home for Lyndonville during the Tigers shutout victory over visiting Alexander this afternoon. 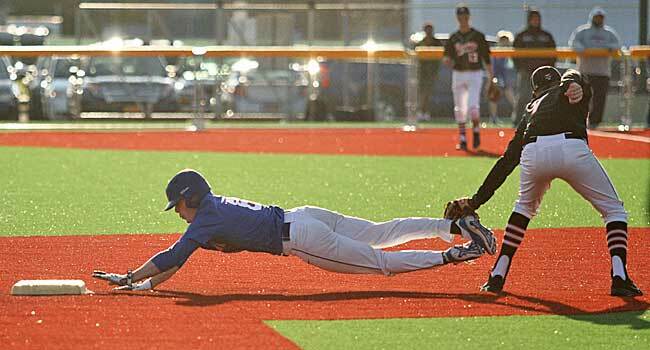 A big early inning scoring burst keyed Lyndonville to an 11-0 victory over visiting Alexander this afternoon in a Genesee Region League game. Two-run doubles by Casey Winiecki and Rolland Balcerzak highlighted the decisive eight run third inning uprising. The other runs came home on two wild pitches, an error and a fielders choice play. Winiecki also had another double to leadoff the big frame. Zach Johnson went the distance on the mound for the Tigers hurling a one hitter with 14 strikeouts. A single to lead off the game was the only hit he allowed. He also had a big day at the plate banging out a solo home run in the sixth inning and an RBI triple in the fourth. The Tigers improve to 3-0 in the league and 4-0 overall. Lyndonville next hosts Pembroke next Tuesday.